MUST SEE VIDEO if you want to feel inspired!!! ONLY $250 for 6 WEEKS includes nutrition plan, quality coaching, 24/7 support, and 3 classes a week in a community of supportive women! MAHALO TO THE WOMEN in this video who have chosen to put themselves first and have seen first-hand how life-changing a commitment to themselves and their health can be! If you are considering starting a CrossFit Journey with our New You 6 Week Fitness Challenge, TEXT 808-357-7851 for your private interview and gym tour now. *There are both morning and evening classes to choose from. 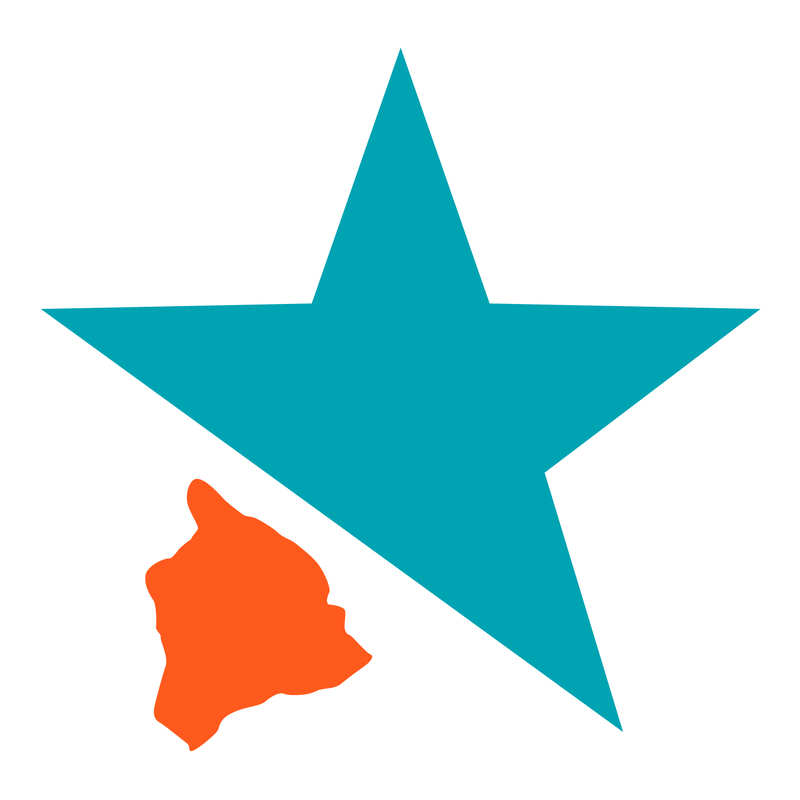 Hurry - Challenge STARTS SEP. 1st in Waimea and is for beginner women (no experience necessary). ALL OTHER CLASSES CANCELLED FOR THIS WEDNESDAY, JULY 4TH. We encourage you to get outside after the workout, go to the beach, or on a hike, or spend time with family, friends, or loved ones if it's available to you. OPEN TO THE PUBLIC AND NON-MEMBERS TO! in Indoor Rowing or Olympic Weightlifting! 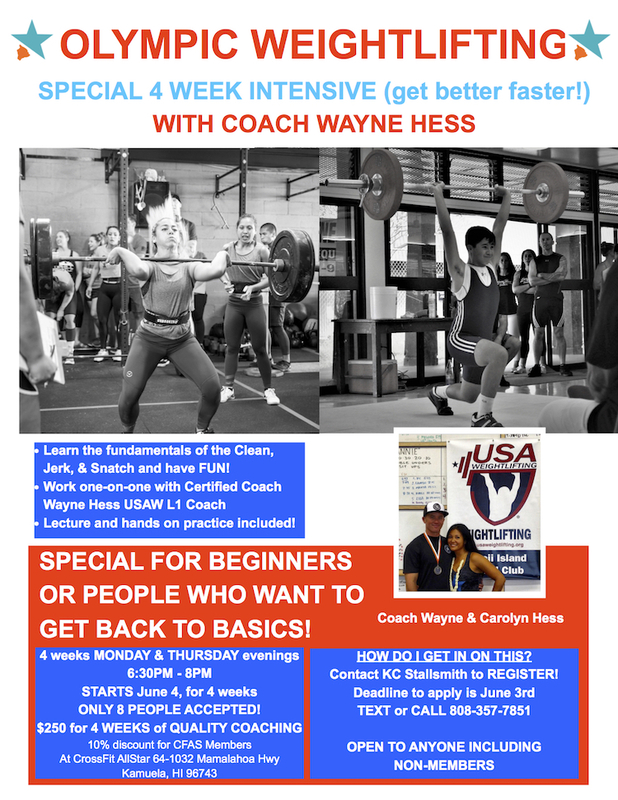 The programs are for beginners to novice athletes, or those that want to get back to basics! Without a doubt, you WILL LEARN MORE FASTER in an intensive setting like this than in a standard CrossFit class! TRUST ME! The purpose of the programs are to provide you with opportunity to gain lots of skill, in a relatively short time frame (4 weeks) by taking intensive skill development training from our top coaching staff. You'll get more one-on-one in these focused sessions, and the attendees will be limited and always remain the same so the class can learn and grow together. YOU COULD GET BETTER IN 4 WEEKS THAN IN 6 MONTHS if you only came to CrossFit class! These programs have a LIMITED number of slots available so act now. Rowing only 6 people accepted and Olympic Weightlifting only 8 people accepted. Cost is $250 and either 4 week program, it will be open to the public, not just CrossFit AllStar members. Our members will receive a 10% discount bringing the cost down to $225. TEXT KC to reserve your spot or talk to your CFAS coach! EVERYTHING STARTS SOON JUNE 4 SEE POSTERS BELOW. MAHALO! Coach KC & CFAS Staff! CrossFit AllStar THE BUILD 6 Week Men's CrossFit Challenge for beginners OR for men who want to get back to CF. STARTS APRIL 28th TEXT KC at 808-357-7851 to schedule your interview today! Includes complete nutrition plan & 3 BUILD classes per week with our CFAS coaching staff. Class times are M, W, F choose from 10:30am OR 5:30pm. Click below to watch a short 90 sec video promo!